South Lake Union is a neighborhood in Seattle. While it’s not the hottest tourist destination, South Lake Union is only a few steps from iconic Pike Place market and, as the neighborhood that is home to Amazon’s headquarters, is a fascinating part of Seattle to include on your itinerary for visiting Seattle. In this post, I’m going to highlight a few of my favorite stops in the Southlake union neighborhood – including some tips on finding the free and fabulous gems hidden in this Seattle neighborhood. if you happen to be planning far – and I mean FAR – in advance, you may be able to snag and Amazon headquarters tour. Tours run only two days a week and fill up months in advance. I managed to book a tour once but was unable to attend when the day finally came. Amazon offers a site where you can sign up for a tour, however, openings to the book are incredibly rare. I book tours by entering the url into a change monitoring service like followthatpage.com, and waiting for an alert when there are any changes (such as a “book now” link added) on the page. the Amazon spheres are a pair of spherical conservatories that are 3-4 stories tall and home to thousands of plants along with a few lucky Amazon employees. The Amazon spheres can generally only be seen from outside, and they are fairly impressive at that distance, but Amazon has recently started permitting tours inside. Understory is a self-guided, museum-style exhibit- that does not require reservations- located underneath the spheres (which most visitors have declared underwhelming). To snag a spot on a tour of the sphere’s biodome interior you’ll need to be patient and lucky, keep checking the booking link in the month preceding your Seattle visit. Amazon Go, Amazons flagship convenience store that is testing a store model that has no checkout, is open to the public in South Lake Union – just around the corner from the dog park. Offering a number of convenience foods as well as grab and go goods from local bakeries and cafés, it’s a great spot to grab lunch to enjoy in the park next-door. Before you visit Amazon go you will need to download an app specific to the store – called Amazon go. Once there, an attendant at the entrance will direct you how to scan and enter the store. Once you’ve selected the items you wish to purchase, you just put them in your bag and walk out! I got food poisoning from a sandwich here once, but for the novelty, I still take friends when they are in town. Cashierless checkout offers the fun of shoplifting with none of the thrill! I’m biased, but my favorite spot in South Lake Union is the dog park at the foot of the Amazon spheres. Between the spheres and Amazon building “Day 1,” there is a small park that is open to the public. The park consists of a small playfield and an even smaller dog park. If you love dogs, this dog park is worth stopping by. I frequently get lunch from FOB poke at third and Blanchard and eat my lunch on a park bench near the dog park. During lunch hours and most hours of the day when the weather is nice this dog park is packed with the extra cute fluffy companions of Seattle’s well-heeled Tech employees. If you need some corgi giggles, some chow chow fluff, or some doodle aww’s, this dog park has you covered. While Southlake union is a shrine to young Seattle and the flashy technology of Seattle’s current tech culture – a few blocks away on the shores of South end of Lake Union there is a throwback to old Seattle. 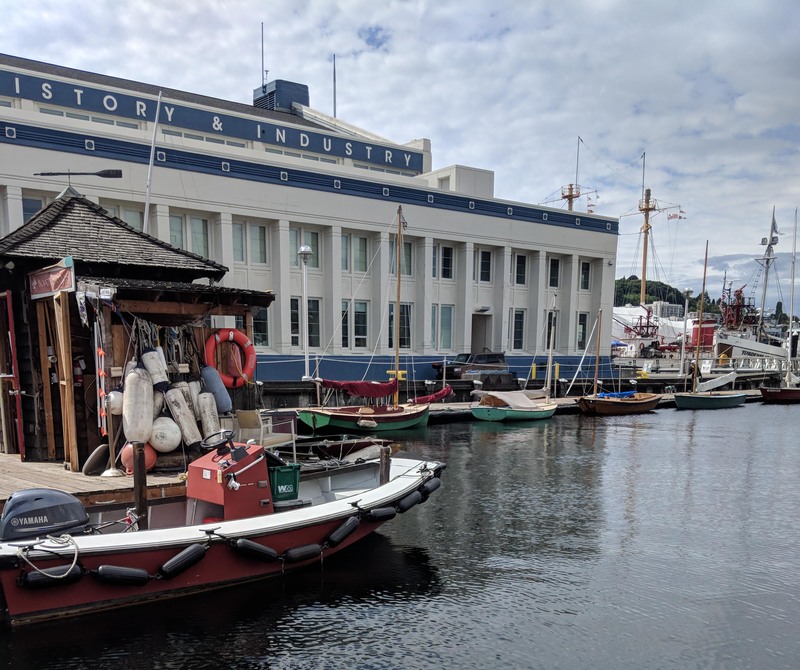 The Center for wooden boats is dedicated to preserving Seattle’s heritage, and not only maintains a collection of wooden boats but on its rambling docks also houses workshops for craftsmen dedicated to preserving Seattle’s wooden boat heritage. 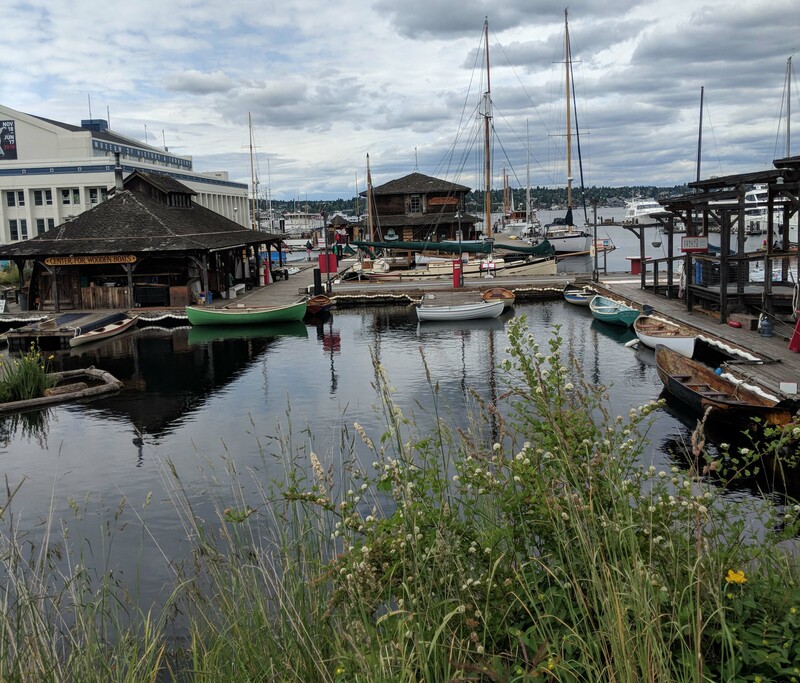 Center for wooden boats is a fun place to visit anytime of the week – interesting antique and vintage boats are docked and open to being boarded by visitors. 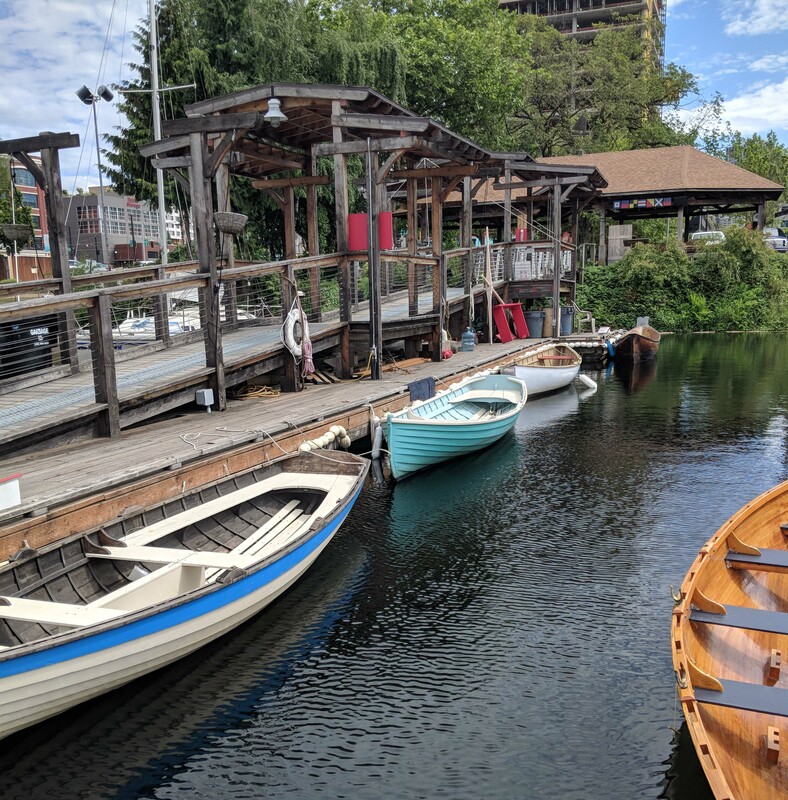 Boat rentals can be arranged here, but on Sunday mornings- if you get up early- you can snag a free sail on one of the center’s amazing vintage wooden boats. the Center for wooden boats free cruises on Lake Union aren’t just a loop or an out and back, most sails last for 45-60 minutes. Sign-ups begin at 10 AM for slots throughout the day, but during the summer you will definitely want to be at the center in line by 9:30 or so to snag a spot on the sign-up sheet. More info on CWB sailing. 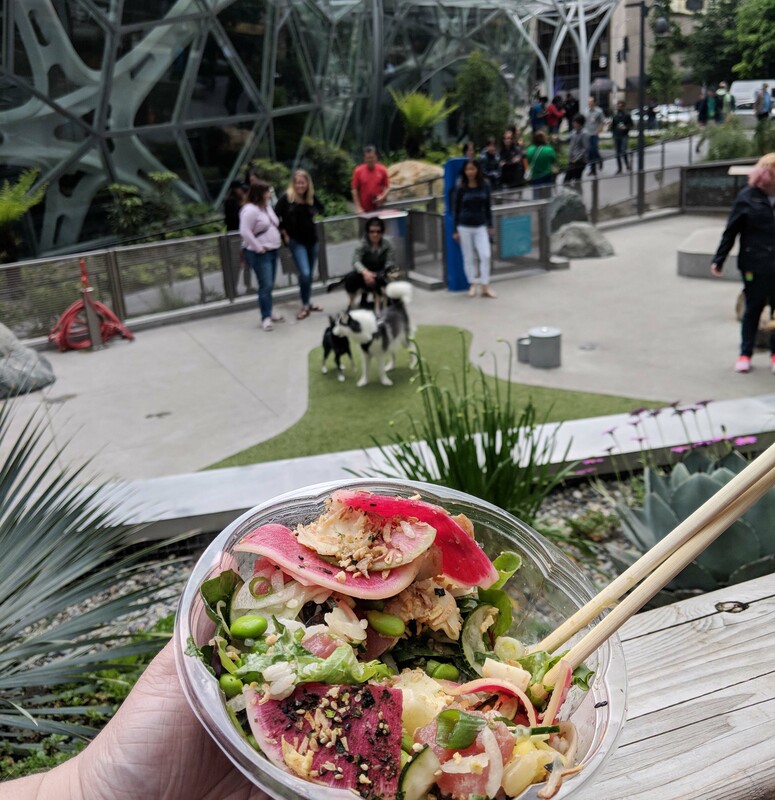 Bar Harbor, Pomodoro, and Portage Bay Cafe are well known and hip spots to grab a great meal in SLU, but for a taste of what the local’s love, head up a few blocks to 3rd and Blanchard St to hole-in-the-wall FOB Poke. Poke is a sushi-in-a-bowl Hawaiian dish that Seattle loves, and people line up out the door for FOB’s $11 poke bowls. FOB Poke – Pro Tip: always ask for extra watermelon radish.